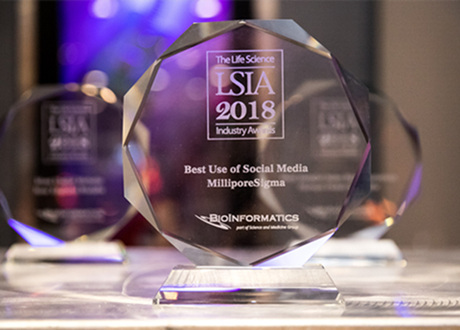 Darmstadt, Germany, January 15, 2019 – Merck, a leading science and technology company, today announced that it has been recognized byBioInformatics LLC with a 2018 Life Science Industry Award® for best use of social media. The Life Science Industry Awards® have been presented every other year since 2002. In 2016, Merck won the award for “Most Memorable Advertising” and in 2014, the company won the award for "Greenest" Life Science Company, recognizing its commitment to corporate responsibility. The scientists who voted are all members of The Science Advisory Board®, a global online community of scientific and medical professionals owned and managed by BioInformatics Inc. since 1997. Merck, the vibrant science and technology company, operates across healthcare, life science and performance materials. Around 51,000 employees work to make a positive difference to millions of people’s lives every day by creating more joyful and sustainable ways to live. From advancing gene- editing technologies and discovering unique ways to treat the most challenging diseases to enabling the intelligence of devices – Merck is everywhere. In 2017, Merck generated sales of €15.3 billion in 66 countries.